Apple's sales slump is taking a bite out of Tim Cook's paycheck. The iPhone maker cut Cook's pay by 15% last year to $8.7 million, according to a filing released on Friday. Apple (AAPL) specifically cited the company's failure to meet its performance goals for both sales and profits. Shrinking iPhone sales last year caused Apple to suffer its first annual revenue decline in 15 years. While Cook's salary rose to $3 million from $2 million last year, his cash bonus took a hit. Apple awarded Cook and other executives 89.5% of their target, instead of the maximum amount like in recent years. That meant Cook's cash bonus fell to $5.4 million in 2016, down from $8 million the year before. All told, Cook's total compensation was $8.7 million last year, compared with $10.3 million in 2015. But don't feel too bad for Cook, whose real fortune is linked to his vast holdings of Apple stock. 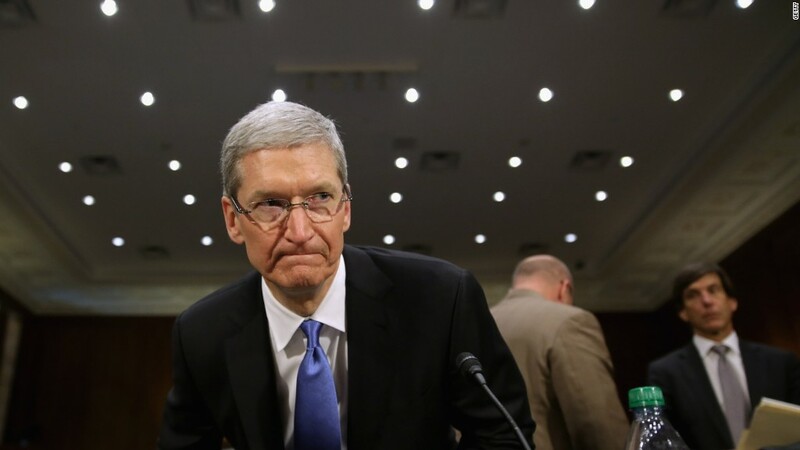 Last year, Cook completed five years as CEO and nearly 1.3 million of his previously restricted Apple shares vested. The shares were worth about $136 million. As in previous years, Cook's 2016 pay was below that of his top lieutenants. All five senior executives below him, whose salary is made public, made just under $23 million in 2016. That includes Luca Maestri, Apple's chief financial officer, as well as retail boss Angela Ahrendts. Apple's rare sales slump is directly linked to the loss of momentum for the iPhone, which generates the majority of the tech icon's sales. Sales of iPhones have declined in each of the past three quarters, slipping to 45.5 million in the September quarter. The problem is that Apple has faced steep competition from Samsung and other smartphone makes and the newest iPhones haven't featured enough upgrades to lure customers. Apple's stock ended 2016 with a healthy gain of 10%. That compares with a 13% gain for the Dow and 9.5% for the S&P 500. The popular stock received a boost in early September thanks to the Galaxy Note 7 disaster, which forced Samsung to discontinue the phone. Apple will reveal just how much it benefited from Samsung's pain when the company reports quarterly numbers on January 31.